Complete bridal party services and group treatments for special occasions. On location services available! 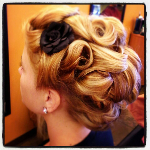 Make it a day to remember with a truly professional bridal hair styling service. Our expert staff stays on top of the latest bridal styles to provide you with a plethora of amazing options to match your wedding style. From classic to contemporary, formal to casual, we can create a wonderfully polished look for your event. Allow a licensed aesthetician or makeup artist to beautify your bridal party with a look that is both consistent amongst the party and personalized for each member.